Killer Characters: Where Have All the Spiveys Gone? Where Have All the Spiveys Gone? I haven’t mentioned the Spivey twins lately, have I? For those of you who don’t know them, Shirley and Mercy Spivey are my late grandmother’s cousins. That makes them my cousins once or twice removed. Or as Granny used to say, the further removed the better. To give you an idea of what Shirley and Mercy are like, no one involved in the yarn-bombing planned for later this week has breathed a word to the Spiveys about it. Actually, we haven’t breathed a word to anyone about it. 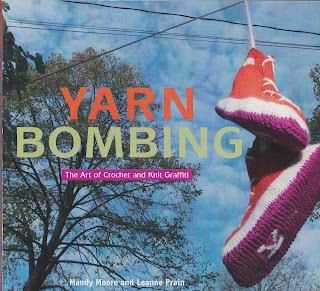 Yarn-bombing is a form of graffiti, and graffiti is best done after dark and on the sly. The way she said “From Chicago” made it sound as though the guy’s last name must be Capone. I had no idea who they were talking about – whispering about – and when I said so, they wouldn't tell me anything else. They just acted disgusted and left. Great. I could ignore that information. I could tell myself that Shirley and Mercy were exaggerating the danger they’d be in if someone found out they told me they’d seen Hugh McPhee with “Al from Chicago.” I could forget I saw the twins and forget I heard their whispered fears. But have you ever tried ignoring something the Spiveys have said? I have, and believe me, it doesn’t work. Spivey words are ear worms. They’re like those songs you don’t want to hear, because if you do, you’ll hum them without ceasing for the next week and a half. But the main thing to remember is that Spiveys are Spiveys. They’re prone to exaggeration, misinterpretation, and manipulation. So, although they might be worried, the yarn bomb squad and I don’t see any reason to cancel our plans for Thursday night. Ardis, Thea, Ernestine, John, Joe, and I – and maybe even Geneva – are going to brighten Blue Plum with stripes and strips of knitting and crochet. I wish you could come with us. You can, vicariously, by reading Knot the Usual Suspects when it comes out September 1st. You can also plan your own yarn bomb foray, and here’s something to help you get started: I have one advance reading copy (ARC) of Yarn Bombing: The Art of Crochet and Knit Graffiti by Mandy Moore and Leanne Prain to give away. 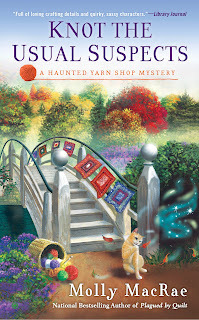 Tell me in a comment what kind of yarn bomb you think it would be fun to create, and you’ll have a chance to win the ARC. Need some yarn bomb inspiration? Google “yarn bomb” and you’ll be blown away. 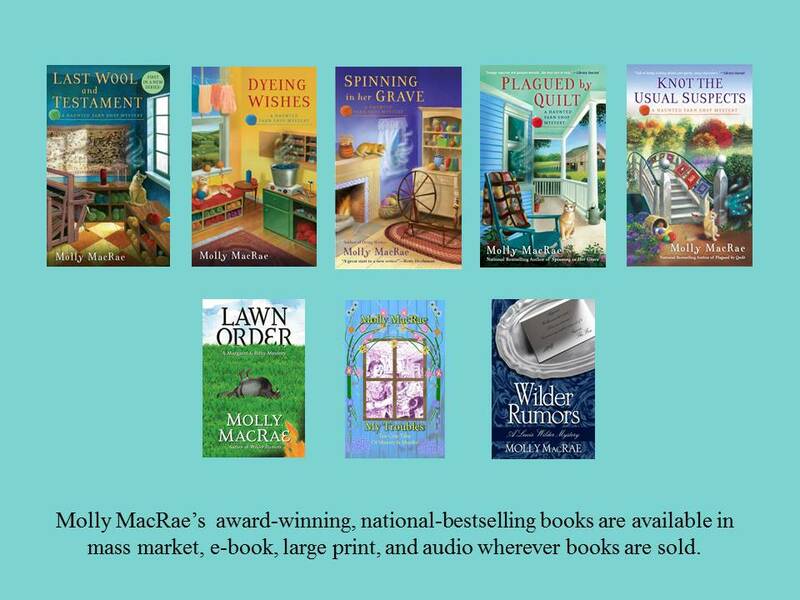 Visit Molly MacRae on Facebook and Pinterest, or find her the first Monday of each month at Amy Alessio’s Vintage Cookbooks and Crafts. With Halloween coming up, I would like to do spider webs. Great idea, Jen. Yarn bomb spider webs are beautiful. Thanks for stopping by the blog today! I'll do the spiders to put on Jen Scott's spider webs! Ha! I want to see pictures of your spiders and webs! And any time you and Jen want to drop by Blue Plum and yarn bomb with TGIF we'll be happy to have you! Maybe I should continue the theme and do a skeleton yarn bomb. Yes! Cool idea, Sue. Have you seen the elaborate knitted skeleton created by fiber artist Ben Cuevas? You can find a link to it on my Weaver's Cat Pinterest board. https://www.pinterest.com/pin/142989356891530741/ Thanks for stopping by Killer Characters today! This isn't exactly a yarn bomb, but in a way it is. I saw where in one town where people knitted and crocheted scarves and placed them around and in trees downtown so that homeless people could take them and the scarves would help keep them warm. That would be so cool if every town had that. I love that idea, Marlene, and I think TGIF should add that kind of yarn bomb to its repertoire. Thanks for stopping by the blog today! Yard bombing sounds like a fun idea. My niece raises Angora goats for their mohair. She could do some fine "bombing"A! That she could! Mohair is lovely stuff. Somebody should yarn bomb the mermaid in front of the Walgreens in our town. She looks so cold in the fall and winter. That's an excellent idea, Nancy. I say go for it. Poor cold, cold, cold little mermaid. Thanks for thinking of her! Oh, I know what I would do! There is a wooden carved statue of a man on the main floor of the library in Eau Claire, Wisconsin that I would crochet a loin cloth for! I always thought his privates needed to be covered and not exposed to my children. Great idea! Better than the bandaid I always wanted to put on it. I would but I don't live there anymore. I visited that library very often when my kids were little. We would check out up to 50 books at a time. That statue always bugged me. They censored books but had that explicit statue there for all the kids to see. And placed prominently at the end of an aisle as you came in the door. He needed a bandaid! I do love yarn bombing of tree trunks. Looks so pretty. Doesn't it? And I've seen such variety. Thanks for stopping by Killer Characters today, Mary! I'd like to ride a yarn bombed bicycle. Wouldn't it be fun to have a whole fleet of them in a parade? A bike rack would be fun, too! I think so, too, Brooke. If you do, show us the pictures! Thanks for stopping by the blog. And the winner of the Yarn Bombing ARC is Jen Scott. Congratulations, Jen! I just got a chance to read your posting and went to post my answer and find out that the contest is over already. Darn. Well, anyway, I can't knit or crochet any more due to severe arthritis and also very bad skin which yarn and thread make worse, but yarn bombing sounds like fun.